where is the example dir, have you posted it? I just updated the blog post with a link to the examples. Please refresh the blog post and see the very end for the link to the tarball. Thanks for posting but unable to download. My apologies, I guess Google Docs cannot handle a file that is that big (92mb). Please send me an email (bruce DOT snyder AT gmail DOT com) and I will transfer you the file via a TransferBigFiles.com. 1) I should be able to send message to any of the brokers. Could you help in understanding on how to setup such a system? I have a similar case to handle. Can you let me know how you handled this. are the messages you sent are persistent or non persistent ? For this demo, I used non-persistent messages. I am new to ActiveMQ and I was struggling with correctly setting up a failover scenario. By looking at your examples I was able to get a network of brokers and set failover up within it. The only problem I had was with a Master/Slave scenario. Just wanted to say thanks for the article it really helped. @John, I'm glad to hear that this information helped you! I have the same issue with IBM MQ. When ever MQ restart / down, my app is loosing mq connections. How can i do with IBM MQ. @Prem, The Spring Framework's DefaultMessageListenerContainer will re-establish connections that have failed when a listener fails. Is this the functionality you are seeking? If so, you would need to use the Spring DefaultMessageListenerContainer to consume messages from IBM WebSphere MQ. This has nothing to do with ActiveMQ. Thanks for your quick reply. Your help in this highly appreciated. Our application is Using WAS6.1, Spring JMS, IBM MQ 6.0 and code is deployed in Websphere pointing to Remote Q. 3) IBM MQ is our JMS provider, which is running on Mainframe. When ever there is an Queue Manager Restart / Down, Our application which is deployed in Web sphere loosing MQ connections and currently we are restarting the app server to regain those MQ connections and start Receiving and sending messages. @Prem, I'm willing to be that your problem is with the configuration of the JndiObjectFactoryBean. I will respond to your email with the specifics. Shouldn't you also set conduitSubscriptions to false so that you have failover *and* load-balancing? @Maikel, I think your problem is with the second question mark. I think it should be an ampersand symbol (&) instead. In your example, you still had AMQ3 a point of failure for producers. What if you want just 2 brokers running in a networked grid, for full redundancy? But AMQ1 and AMQ2 are connected together so that messages on AMQ1 are picked up by CONS2 too, and vice versa CONS1 can also pick up from AMQ2. Would you recommend having 2 network connectors (one on each AMQ instance), or one network connector on one of the instances in duplex mode? I am slightly inclined to the first alternative (also to have deployment as identical as possible between instances). The advantages of using a duplex network connector include a savings on the number of sockets that are opened by the brokers in the network, a simpler configuration (albeit sometimes kinda confusing - see below) and the ability to traverse a firewall from a hub broker when using a hub and spoke broker topology. The disadvantages of the duplex network connector include the fact that it can cause some confusion for folks who are not familiar with the way that the network of brokers is configured. For example, if they only look at the configuration of the broker without a network connector, they may be inclined to think that there is no networked configuration. Comments in the configuration file can alleviate this disadvantage. Also, you must be careful using conduitSubscriptions on a duplex network connector if your consumers are using message selectors. If so, you need to disable conduitSubscriptions so that those selectors will be respected. OK, so given there isn't an issue with the number of sockets, it would work to have 2 AMQ instances with 2 non-duplex sockets connected to each other? I am looking at a simple dual node configuration, with 2 identical producer applications, each with embedded AMQ inside them, and a number of consumers (say 2 just for the sake of the example) picking off messages from these 2 queues. I want the 2 AMQ instances to look as one, and the consumers would load-balance (and failover between themselves) irrespective of which queue they're connected to. Yes, you can use two brokers, each of which defines a non-duplex network connector pointing at one another will work just fine. You will need to use a failover transport in each consumer that contains the broker URIs for the two brokers. That way if one broker goes down, the consumer will automatically reconnect to the other broker and continue it's job. I am configuring a slightly different scenario (bad char art): Hub1 and Hub2 have simplex connections pointing to each other. AMQ1 and AMQ2 connects to the hubs using duplex connectors, and any producer/consumer only connect to AMQ1/2. as the startup process of AMQ got stuck when trying to start the network connector. I have setup everything as you wrote. However when I place advisorySupport="false" in the broker tag of all the amq*.xml and start all the brokers. All the produced messaged then go in pending state on the broker running on port 61617 and consumers never get the messages. Does the network of broker stop forwarding messages without advisorySupport enabled? I thought that was fixed in recent release. (I'm using activemq 5.4.2 release). @ Anubhava, When an ActiveMQ dynamic network of brokers, advisory messages are required in order for the brokers to communicate state to one another. When you disable support for advisory messages in a dynamic broker network messages will stop flowing. This is not a bug, it is by design. If you want to disable advisory messages in a network of brokers and still allow messages to flow properly, you must configure the broker network statically. For more information, check out the page about networks of brokers. Thanks a lot for your reply. I have read http://activemq.apache.org/networks-of-brokers.html page few times. So even though uri here starts with static: is it not static? @ Anubhava, You are correct, that is a static URI for the network connector. This applies to a situation where the default credentials.properties file is being utilized from the activemq.xml config file. The solution is to make sure to use the default username and password in the network connector configuration. Try that out to see if it solves your problem. But still it didn't forward the messages to other network broker when advisorySupport is false. @Anubhava, I'm sorry that my suggestions have not helped your situation. My advice at this point is to post a message to the ActiveMQ user mailing list so that Dejan or Gary can have a look at your problem. See the doc about the mailing lists/forums. I have a question, can I have a network of brokers as well as the Shared File System Master Slave (http://activemq.apache.org/shared-file-system-master-slave.html) with the same set of brokers (amq1, amq2 and amq3)? Like, right now in your example, amq3 broker xml file has the entry about amq1 and amq2 as Network-connector, and producer and consumer are using the URIs as their respective brokers they are directly connected to? Now, lets say I do configure all of them in shared-file-system-master-slave also, and then give the set of URI's to clients in failover transport URI, Is that fine? In an ActiveMQ master/slave configuration, a slave broker does not fully start up until the master broker fails. Although you can use a networked configuration with slave brokers, so that when they do start up they will use it. But a slave broker is not available until the master fully fails. > transport URI, Is that fine? Yes, when you configure a master/slave scenario, you must give the clients the URIs to the master as well as the slave using the failover transport. In the event that the master fails and the slave takes over, the failover transport on the client will be able to automatically reconnect to the slave when it comes up. Thanks Bruce for the detailed info. a slave broker does not fully start up until the master broker fails. It means, I cannot have master/slave between amq1,2,3 with clients connected to all three, right? I have to have amq 1m,1s,2m,2s,3m,3s - total 6 of brokers, every m & s sharing file system. Now, every corresponding connected client has to be given a transport URI having m & s both. (a) Like in your ex, amq3 has entry about amq1 and amq2 as network connector, how will that be in this case? 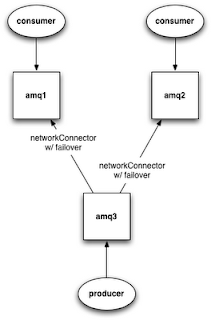 (b) I know network of brokers is for scalabilty, for HA, we already have m & s, but lets say both 1m & 1s fail (down), then is there a way to connect client of amq1 to other set of amq- m & s without manual intervention through a prior-config? @Deepak, If you are deploying each broker in a master/slave pair with six brokers in total, then you can certainly have client apps connect to all three. You will want to make sure that each client app uses the failover transport with a list of all the broker URIs. One thing that you cannot do is share the data directory between active brokers. The shared filesystem master/slave configuration is meant to share the data directory between a master broker and slave brokers where only one of these brokers is active at any given time. You cannot allow two active brokers to share the same data directory. Doing this will result is very unpredictable behavior as this is not how ActiveMQ is designed to operate. In a situation where you are deploying master/slave pairs instead of single brokers, the network connector configuration will need to make use of the failover transport along with the broker URI for the master and the slave. This way, if the master broker fails, the failover transport will automatically try to reconnect to one of the brokerURIs in the list. With the proper failover transport configuration options, when the slave broker becomes the new master, the failover transport will establish a connection to it. > intervention through a prior-config? The common solution to this situation is to use the shared filesystem configuration because you can point as many brokers at the same data directory as you like, but only one of those brokers will ever become fully active at a time to be the master. The first broker to grab the lock on the data directory is automatically considered the master broker and all other brokers that are pointed at the same data directory are automatically considered slaves. If the master fails, the first slave to grab the lock on the data directory automatically becomes the new master. When using such a configuration, it's very common for folks to use some type of a watchdog process (such as daemontools). The purpose of a watchdog process is to automatically restart a broker if it goes down. This minimizes the number of brokers that you need to run pointing at the same data directory. But it's common for folks who are using a watchdog process to still run brokers in pairs so that if the master goes down, the slave will automatically become the new master and the watchdog process will restart the broker that went down allowing it to become the new slave. As described above briefly, when using a master/slave configuration, all client apps should utilize the failover transport with a list of broker URIs for all brokers involved (i.e., both master brokers and slave brokers). If the broker to which a client app is connected fails, the failover transport will automatically start trying to connect to other brokers in the list of URIs. Thanks Bruce for the detailed replies, I will get back to you after I experiement with all the combination of scenarios I have in mind as stated above. (1) We implement onMessage() method of MesssageListener(), it runs in different thread, the question is whether that thread is blocked until we are done with the processing of message in the onMessage() or it has set of threads for next messages, and onMessage() doesn't block its own read? @Deepak, the session thread that executes a message listener's onMessage method does so in a serial manner. This means that only one message is handed by the onMessage method at a time. This is a rule from the JMS specification (see section 4.4.14 of the JMS 1.1 spec). Thanks Bruce. So it means that onMessage() will be blocking its own read. @Deepak, A MessageListener does not read messages from the broker (i.e., pull messages). Instead, the thread in which the MessageListener is executed is from the broker side and it pushes messages to the MessageListener's onMessage() method. There is no blocking behavior, it's simply a matter of serial execution in the thread on the broker side. Again, this is mandated by the JMS spec, it is not ActiveMQ specific. Every thing works well at startup, i can see the customer subscription on bridge and left broker. @Bakhti, how have you defined the bridge? If you're using the jms-to-jms bridge feature in ActiveMQ, I recommend using the ActiveMQ component for Apache Camel instead. The jms-to-jms bridge has not been maintained in a while because the Camel component basically replaced it. @javalearnerny, What I was referring to in that response was the use of the ActiveMQ failover transport. Using this transport from a JMS client will allow you to specify as many broker URIs as is necessary for your situation via a comma separated list of URIs. The failover transport will then connect to one of those ActiveMQ brokers via its URI. If that broker becomes unreachable (i.e., goes down) then the failover transport will automatically attempt to connect to another URI in the list. With the proper configuration for reconnect delays, retries, etc. on the failover transport, this can alleviate connectivity issues from the client side. Regarding your question about whether they should duplex -- this seems to be a confusion between master/slave config and a network of brokers. These are two wholly different concepts whereby the master/slave config is for high availability and the network of brokers is for message broker clustering purposes. The duplex option is available on a network connector when configuring a network of brokers. Whether or not you should use this is not clear to me based on your limited description. This network connector would be defined in the activemq.xml config file for a broker whose brokerName is brokerA. Notice that it points to both hostB and hostD (where brokerB and brokerD respectively reside) but not to hostC. This is because the diagram shows a ring topology where each broker connects to only the broker on either side of it. Of course, this is a guess and based on assumptions, but hopefully it helps you out nonetheless. We are using ActiveMQ 5.5.1 and have decided to use Kahadb filestore (which is on SAN) for persistence. We have 2 brokers, 1 each on a different server. We are trying to achieve failover as well as load balancing. Could you please explain how is this possible with just one filestore and 2 brokers. With only one filestore (SHARED FILE SYSTEM MASTER/SLAVE) I understand that I can only have one broker as active(master) at any given time and the slave gets activated only when master is down. With a filestore on SAN, how do I achieve both failover as well as load balancing with 2 brokers. Could you please guide me? Notice that the brokerUrl uses the failover transport and inside it both broker URLs are specified. This tells the JMS client to connect to the first broker URL but if that one becomes unreachable, automatically reconnect to the next one. This will handle automatic failover between the master broker and the slave broker in the event that the master broker goes down. The one thing that you need to know about this scenario is that the master broker will not automatically be restarted. You will need to find a way to bring it back up using some sort of watchdog process. I often recommend using the daemontools for this purpose and its supervise utlity. I should have asked my question in detail. I have 2 brokers A and B running on two different servers. I would like Broker A and Broker B to use same filestore while having a duplex connection between these 2 brokers. Enabling duplex connection will help to distribute the load between the two brokers (store and forward). I understand Failover can be achieved by clients specifying both A and B while making call. The challenge seems to be that how can I have these 2 brokers share the same filestore while both of them are running and active. @Suresh, Your previous question mentioned master/slave which is why I provided the answer I did. What you are now asking is about creating a network of brokers between the two message brokers and having them share the same data store. Creating a network of brokers is certainly possible, but two active brokers cannot share the same data store. The reason for this is that the broker state is kept in the data store and if you point two active brokers at the same data store you will get unexpected results. The only way for two brokers to share the same data store is when configuring master/slave capabilities because only one of the brokers is up and running at any given time. In a network of brokers, each broker has its own data store. So you can configure master/slave between two brokers. You can also configure a network of brokers between two different brokers. But these two configurations are separate concepts and based on your questions of these concepts kind of overlapping, I think you're mixing the two together. great article. So we are implementing slightly different from what you have done. amq1 or amq2 to receiver messages. amq1 is master and amq2 is slave. so if amq1 goes down, consumer successfully connects to amq2 and receives the messages. But only problem we have is we want consumer to connect back to amq1 after amq1 is up . how do we achieve that ? In the diagram that you have, is it possible to have one consumer that listens to messages from both amq1 and amq2 at the same time? @Mohan, the way to achieve what you want is by using the updateClusterClients and rebalanceClusterClients features that I outlined in another blog post titled New Features in ActiveMQ 5.4: Automatic Cluster Update and Rebalance. @Sunil, the only way to have a single JMS client listen for messages from two brokers concurrently is create a custom JMS client that makes a connection to each message broker manually. There is no inherent support for such a thing in JMS. Thanks for you previous reply. It was very helpful. We are trying to group messages by groupId from 0 to n We set before sending the messages. This runs inside a stand alone java application. We have one instance running on each of the n machines. With this setting, the listener container on the machine 1 processes messages with JMSXGroupID='0' and so on for other machines. My spring bean definition xml doesn't show up there. But basically we are using messageSelector property with value JMSXGroupID='n' to ensure that the message with a particular group Id is only processed by a particular listener. At any rate, your question sounds rather complex and ActiveMQ specific. For any complex situations, it always helps to construct a test case that is stripped down to the bare minimum so that it only focuses on the problematic area. Not only is this good to have when asking questions on a mailing list but oftentimes I work through my own problems by doing this. I would appreciate if you could give me some ideas as to why my Consumer dies out rather than failing over to the slave? @joesan, It looks like you've gotten help on this issue via the mailing list. Is it possible to set up AMQ failover so, that master is in one PC and secondary is on other PC? If yes, how should I configure? Sure, it's designed to be easy to set up each broker on a different machine. You simply configure the networkConnectors and transportConnectors to use IP addresses instead of the term localhost. We've currently setup ActiveMQ 5.7.0 as a network of broker configuration with just 2 brokers. BrokerA has the networkConnector block commented out, BrokerB has the networkConnector listing BrokerA as shown below. We are experiencing the issue of queues which are "stuck" after some time...meaning, consumers are connected to the brokers but nothing is being consumed off the queue. The queue size just remains stagnant. We've configured our client's broker url as such --> failover:(tcp://nybeta01:7550,tcp://njbeta01:7550)?randomize=false&timeout=10000 ... The clients also use spring JMS and PooledConnectionFactory provided by activemq. We've searched numerous forums to see if there was anything else we could try. We've even introduced the conduitSubscriptions=false & enableAudit=false pproperties in the destination policy but that didn't seem to work either. Do you have any insight as to what could be the issue? The solution here is to lower the prefetchLimit to either 0 or 1, the default for the prefetchLimit is 1000. Lowering the prefetchLimit to such a lower number tells ActiveMQ to only allow the consumer to prefetch either 0 or 1 messages and will result in faster processing of acks and therefore not allow messages to accumulate on a consumer. Hi Bruce, Thanks for the last post regarding the prefetchLimit setting. We are using that in our setup and it has helped with the stuck messages. We are implementing another setup in which we have 4 machines (brokers) running as a Network of Brokers. Can you recommend a topology we can use where consumers/producers can connect to any one of the 4 brokers? We've started off with configuring the networkConnector for each broker to point to its neighbor as such A -> B -> C -> D -> A (a box pattern) with duplex=true for all the brokers. We're not sure if this configuration would help in the event of a broker failure (shutdown). Are we going towards the right direction? Are you also utilizing the broker-side failover support (i.e., rebalancing of cluster clients)? There are some features to support broker-side failover that allows clients to move from one broker to another in the event of a broker failure. Hi Bruce -- Yes, we are making use of the broker-side failover options as well...do you have any other suggestions as per our current box pattern setup? Because each environment is different, it is difficult for me to say if this is going to work best for you. The only way to know for sure is through comprehensive testing using the exact type of traffic that this architecture will experience in the production environment. Never, ever roll out a system to a production environment with a question in your mind about how the system will perform. we are using message-driven bean to process messages and using container to receive messages. When Application Server is started, for each deployed message-driven bean, its container keeps a connection to the JMS provider. When the connection is broken(ActiveMQ is stopped), the container is not able to receive messages from the JMS provider and, therefore, is unable to deliver messages to its message-driven bean instances. This is the reason we had to take restart of application when active mq was restarted. Good post. What is the diagram software you used to create these diagram? Hi Bruce,we have setup ActiveMQ 5.13.0. It works fine. We have data in message format in MYSQL DB and we are able to send the data to broker on some button click event and then it is further processed by the broker. We have a question, Can we pull the data from producer immediately when activemq starts up instead of button click event? I think I'm missing some context because I don't understand how sending a message via a button click event is any different from sending a message when a producer starts up. Can you explain more about what you're trying to do? Can you please clarify why Network of Broker is not highly available when we use failover protocol. Please clear me with example if possible. Our requirement is somewhat hybrid I mean master-slave along with Network of Broker. Can it be possible? Can the stuck messages will be consumed if use both? When I still did consulting around ActiveMQ, I always recommended that a customer make use of master/slave along with a network of brokers (NoB) in order to provide a level of HA. Additionally, you need to create an infrastructure that will bring failed masters back as soon as possible so that they can be slaves to the new master. The downside to NoB is that it can be very chatty so you need to dial down the amount of broker-to-broker communications to only those that are really necessary. This can include segregating what messages are replicated to what brokers, and this can be a very complex and time consuming task. What I always recommend is to start such an endeavor on a smaller scale before moving to the production level size system. The reason for starting small is to develop a deep understanding of how the ActiveMQ NoB works and what it needs to do to support your business case before taking the steps to build out a full broker network. else it was not working. To answer your question, the NoB needs to know all potential masters and slaves, not just masters. When a master fails, a slave is promoted to the master and there is no assumption that a slave takes over a master's IP address or port number. In fact, slaves run in a kind of warm, stand-by mode so that they can grab the file lock as quickly as possible. So even if a slave is running on the same IP address as a master, they must run on a different port. Making a NoB aware of all potential masters and slaves takes care of the case where a master fails, then the NoB knows to try to contact the slave. We are using ZooKeeper LevelDB for our ActiveMQ and we put the logCompression="snappy" to compress the old data logs but still not compressing properly and after some times activemq showing Disk Space issue. Is there any way to delete or purge the old data files from the disk so the space will be always available? Any idea why messages are not consumed on consumer level after sometime but messages are showing as 'Pending' and if we click on the Browse link , no messages are shown. I am working on a POC related to ActiveMQ. I need you help whether the following is possible or not with ActiveMQ. Can Master/Slave configuration concept is achievable with one local activemq instance and a remote activemq instance? I have tried with two local instances and its working fine. But whether the same is doable with one local machine and another in remote machine?